Eight new places will appear in Tamriel after you install the plug-in. They can all be discovered without starting any of the plug-in-related quests. However, access to the interiors may be prevented until the appropriate quest has been started. The Chapel of Anvil is ruined. Gauntlets of the Crusader appear in a corner of the Chapel of Stendarr in Chorrol. Lord Vlindrel's tomb and wraith are added to Underpall Cave. The Spiritual Plane becomes visible from the Imperial City. 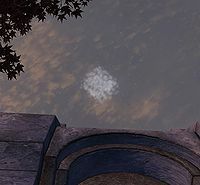 After installing Knights of the Nine, the cloud platform from the visions of Pelinal and the battle with Umaril will be visible in the sky when close to the Imperial City exterior walls (see right). This page was last modified on 7 October 2013, at 17:21.